“How many of you use social media?” Nick Chernoff from Safer Schools Together asked Grade 5, 6 and 7 students from Tuc-el-Nuit and Oliver Elementary schools. Most of them raised their hands. 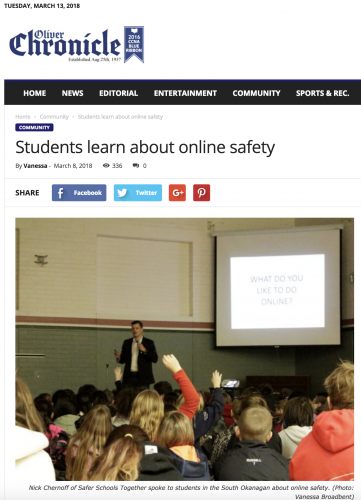 Chernoff spent last Tuesday presenting to students and parents in Oliver about the risks that come with using the internet – especially social media. But rather than only focusing all the things that could go wrong, Chernoff talked about how kids can increase their safety and use the internet for good. “With great power comes great responsibility,” he told students, delving into discussion on not believing everything you read on the internet – especially who someone you don’t know says they are. He made it clear to never add someone you don’t actually know in real life. Chernoff told the story of Stacey Grant, who posted on Facebook that she was away on holidays with her family. One of her Facebook friends saw the post and knowing that the house was empty, burglarized the home. “Post when you get back,” Chernoff told the students. This includes thinking twice before posting personal information, as well as comments that may be hurtful to others. He shared an acronym that students could use as a checklist when deciding whether or not to post something: THINK (is it true, hurtful, illegal, necessary or kind). But kids weren’t the only ones who learned about the pros and cons of the world wide web. The provincial government announced on Feb. 28 that they are providing $100,000 to the B.C. School Superintendent’s Association (BCSSA) to fund social media education sessions for parents in every school district in the province. The BCSSA has partnered with Safer Schools Together and as a result, Chernoff also hosted a discussion for parents at Southern Okanagan Secondary School. At the discussion, Chernoff shared how parents can speak to their children about their online activity, rather than shelter them from the internet. Chernoff said that it’s next to impossible to keep kids away from social media, especially as they get older. While they’re young, it might be a good idea to keep them from creating accounts, but as they age, they’ll likely find a way to access it – with or without parent permission. That includes having daily conversations about online activities. Safer Schools Together provides parents resources online, to make these conversations a little easier. Chernoff also presented to students in Osoyoos on Monday.